The two suckers I got from my Juliet’s came off roots that were traveling right under the surface through my compost. It made it real easy to dig and pull the second one up by hand. I was thinking the bush was seeking out the compost I feed them. I want to expand my compost areas and add more. It’s hard to tell from only a two sucker experience, but adding more compost can only help feed the main bush anyway. I have family and friends that want them. Any woods near by? Trans locate them to the edge or a park. The change of environment might get them going. I’m going to be in DC 18-20th for work. I could take them to my lot. I’m going to be in DC 18-20th for work. I could take them to my lot. If you mean you’ll be around April 18-20, I’d be happy to have you take them. I might even give you a few other things I have in pots as well. Edit: I looked more carefully today and I don’t even have a Crimson Passion! My record books were wrong somehow. I think I bailed on it due to all the complaints here. Anyways the “CP” referred to above is in fact a Carmine Jewel, and it also has one or two blossoms on it. What is your plan for PC with these cherries? 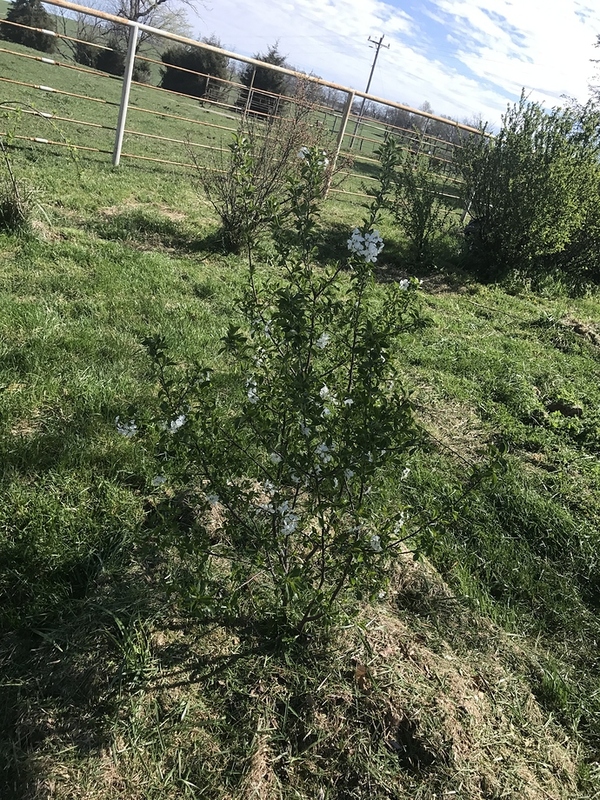 Mine were hit hard last year by the little devils and I would imagine if you use surround you’d have to basically coat the entire plant to get the fruit covered. If you do use surround I’d love to see a picture. Or if you have another suggestion I’d love to hear it. I was so excited to get clean perfect cherries the first year and then bummed out last year when there were bites on almost every cherry. Yes, if fruit sets I will hit with Surround. It works great on my regular cherries so it should work here as well. Great. Anywhere that carries it locally in the mid Atlantic or do you get it shipped? I had just about given up on my peaches as well, but maybe it is worth trying to save them with surround. I just get it shipped, I think 7springs.com is where I got it last time. I used to get a bag at a time but I think I got four bags last time. My feeling is with experience you can manage PC with Surround only. It takes experience in terms of when you need to freshen the coat and how to get on a good enough coat. Even with less experience you will get reduced PCs. I am still learning a thing or two, for example the need for much later sprays on Euro plums I still don’t quite have down perfectly. For peaches I stop in early June, once the fruits are nickel sized the PC doesn’t like them. Unless they are Euro plums. Great info. Sorry, hope I’m not derailing the thread, but a couple more quick surround questions since I’m not planning to spray the cherries and my peaches. Do you find it works for codling moth / oriental fruit moth as well? Also, I just ordered the surround, but I also spray an egg mixture to deter deer and was wondering about mixing that in with surround. Have you seen any squirrel or deer benefits with surround itself? Surround provides some help with OFM/CM, and if you also include spinosad it can be very helpful. Feel free to mix anything with Surround besides a sticker. Some deer repellants may have stickers in them so they may not all work. If you use Spinosad, why would you need Surround, too? Spinosad sprays do not last long. With spinosad surround and mating disruption all together, I still get some moths. I was thinking with the new trees I fenced with chicken wire I could cap the top like your saying and the birds wouldn’t get in. I might still have problems with the chipmunks though. I’ll look into the surround. If closing the top of chicken wire, be aware that heavy snow can squish whatever is below it. Undo the tops over winter. With the addition of two more Juliet cherries from Costco I have officially gone too far. I really hope these work for me. The two new ones are significantly larger than the previous two I purchased and cost half as much… if I had known I would have waited and bought all 4 at Costco. Growing fruit is addicting, isn’t it? There are probably 5-6 suckers coming up around one of my Carmine Jewels. I accidentally pulled one out while weeding today. Costco by me doesn’t have a garden center.